Neurosis, a chamber musical in the compact DR2 theater, is full of small pleasures. It’s the kind of show that doesn’t “kill” but supplies grins and smiles generously. First, there’s the central conceit: a gangly would-be magician named Frank (Kevin Zak) is accompanied everywhere by his sidekick (Brennan Caldwell). Initially, as they brush their teeth together and advise each other on whether they’re presentable, one suspects the two are a gay couple. But Caldwell, it turns out, is Neurosis, the embodiment of Frank’s psychological hangups. He nags at Frank and keeps him on edge, unsure of himself, as psychological afflictions can do. Neurosis (Brennan Caldwell, left) isn’t happy when the human he nests in, Frank (Kevin Zak), meets a young woman (Jennifer Blood) who starts to diminish his powers. Top, from left: Joel Blum as Frank’s father; Morgan Weed as Neurosalina; Blood; Zak; Caldwell; and Susan J. Jacks as Frank’s mother. The voice you always knew? It’s a pleasant surprise, too, to find that lyricist Greg Edwards can write clean, intelligent rhymes, and Ben Green’s music is tuneful. A visit to Frank’s Jewish parents, Geri (Susan J. Jacks), who has a mania about placement of tableware, and Kenny (Joel Blum), who rebels against her pushiness, reveals the source of his insecurities. Poor Frank has to contend with their displeasure over his chosen profession. He wants magic; they want the law or medicine. And although the book by Allan Rice trades in overbearing parental stereotypes, especially among Jews, it comes off as affectionate even at their most abrasive. Meanwhile, in alternating scenes, a young woman named Abby (a charmingly hesitant Jennifer Blood) is contending with her own, symmetrical problem: Neurosalina. Abby has a chance to take a job with better pay in another city, but she’s tied herself in knots thanks to Neurosalina (Morgan Weed). It’s inevitable that Frank and Abby meet, and somehow sparks fly, though quickly extinguished by the neuroses, who come to an uneasy truce. Still, after a second chance, Frank and Abby end up in bed, and slowly their neuroses lose their power. Eventually, it’s time for Abby to meet Frank’s parents. Things start smoothly, then get bumpy. “And where do you see yourself in five years?” Geri asks Abby. “Working. Maybe a mom,” says Abby. Lacretta plays Samantha, Frank’s therapist. Photographs by Jenny Anderson. There’s nothing particularly fresh about a nebbish as a hero—think Seymour in Little Shop of Horrors—yet despite the use of tried-and-true plot devices, Rice’s book has many original moments beyond the idea of tag-along neuroses. Lacretta’s therapist Samantha, for instance, asks Frank to alphabetize her bookshelf, and immediately Caldwell’s Neurosis, with a prissy determination, goes to it, freeing Frank from his shadow and allowing Samantha to get some direct answers. 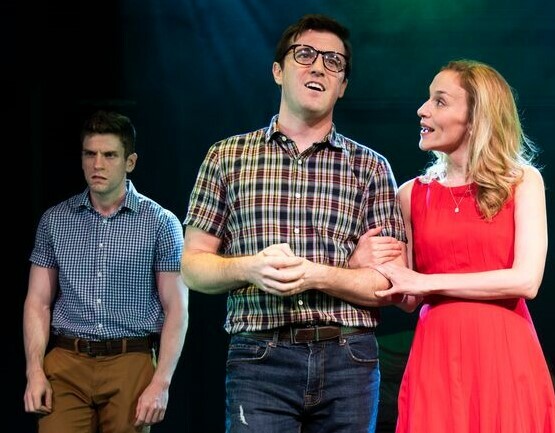 Under Andy Sandberg’s direction, the show moves smoothly and swiftly; although it runs only an hour and forty minutes, the angst-obsessed show gives the audience a break by incorporating an intermission. Caldwell, a dynamic performer with the blessing of charisma, benefits from having a title character who’s a more powerful presence than Zak’s Frank, and he seizes the role and runs with it. He comes across as someone you’d like on your team even if he is always pointing out the downside. There’s an eager, puppyish quality that explains why Frank would always want to mollify him. The tall, imposing Zak finds a deft balance between doofus and hero, and has a way with a lopsided grin. Splendid, energetic dances by Shea Sullivan allow all the principals to break out of their shells; both singing and dancing are outstanding. Ultimately, although the pleasures of Neurosis are modest, they are solid, and elevated by the extraordinary talents of a hard-working cast. The musical comedy Neurosis plays through Oct. 20 at DR2 Theater (103 E. 15th St., off Union Square). Evening performances are at 7:30 p.m. Wednesday and Thursday and at 8 p.m. Friday; matinees are at 2:30 p.m. Saturdays. For information, visit neurosisthemusical.com.